Collection WALK ON THE WILD SIDE - TEE LOVERS 70, S.L. Collection WALK ON THE WILD SIDE There are 37 products. Kimono with cotton fringes ornament. Materials: 92% VISCOSE 8% ELASTAN. Color: T&D STRIPES BLACK. One Size. Kimono with cotton fringes ornament. Materials: 92% VISCOSE 8% ELASTAN. 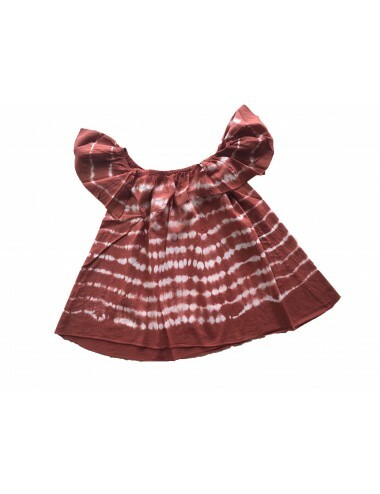 Color: T&D BATIK BURGUNDY. One Size. Shirt with fringed openings on both sides. Materials: 100% COTTON FLAMÉ. Color: T&D BATIK RUSSET/BROWN One Size. V-neck shirt with short sleeves. Materials: 100% COTTON FLAMÉ. Color: WHITE BARDOT. One Size. V-neck shirt with short sleeves. Materials: 100% COTTON FLAMÉ. Color: KHAKI BIRKIN. One Size. Short jumpsuit with elastic waist, neck and sleeves. Adjustable trousers. Materials: 100% POPLIN VISCOSE. Color:BEIGE. One Size. Short jumpsuit with elastic waist, neck and sleeves. Adjustable trousers. Materials: 100% POPLIN VISCOSE. Color: T&D BATIK CURRY. One Size. Short jumpsuit with elastic waist, neck and sleeves. Adjustable trousers. Materials: 100% POPLIN VISCOSE. Color: T&D STRIPES KHAKI. One Size. Short jumpsuit with elastic waist, neck and sleeves. Adjustable trousers. Materials: 100% POPLIN VISCOSE. Color: T&D BATIK BUGUNDY. One Size. Pucker top with elastic waist, neck and sleeves. Materials: 100% POPLIN VISCOSE. Colors: T&D STRIPES NAVY. One Size. Evasé top with elastic neckline and shoulders. Materials: 100% BAMBULA COTTON. Colors: T&D BATIK RUSSET/BROWN. One Size. Evasé top with elastic neckline and shoulders. Materials: 100% BAMBULA COTTON. Colors: T&D STRIPES BLACK. One Size. High waist draped skirt and fringed on one side. Materials: 92% VISCOSE 8% ELASTANE. Colors: T&D STRIPES RUSSET/WHITE. One Size. 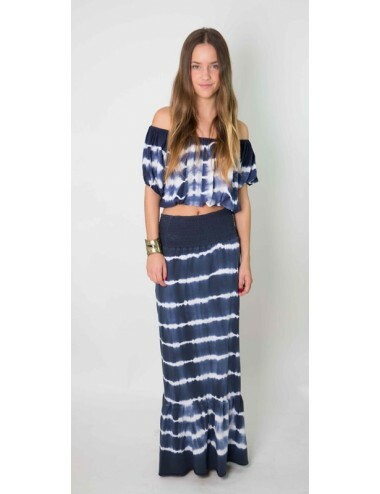 Long dress with halter neckline and ruffle on bas. Materials: 100% COTTON GAUZE. Colors: T&D BATIK RUSSET/BROWN. One Size.